Every once in a while something comes along which really makes me despair in the future of cinema. Today it this post by Hunter Walk. First of all, this person wants to multitask during the film, use his phone to check the internet, send emails etc. Do I have to explain why this is a bad idea. The reason cinemas are so dark is so that the attention of the audience is focused on the screen so that they don't miss anything from the film and the only way this can possibly be a good idea is if we get to a point where phone screens are like laptop screens and can only be seen from a certain angle. If you look away to check your phone you stop paying attention and you may miss important information. When watching films at home I've often checked my emails whilst watching and in most cases I've had to either pause the film or rewind it so I didn't miss anything. This goes into my second point. Why would you want to do this in a cinema where you could disturb loads of people when you could do it at home. If something is so important that you can't turn your phone off for 2 hours then you really shouldn't be going to the cinema in the first place. At home meanwhile, if something important comes up you can simply pause the film, deal with the issue and then resume watching the film at your own pace. That's why it's okay multi-tasking while watching films at home, you don't miss anything because you can pause the film whilst at the cinema, you are restricted by the times of the films. Whenever I go to the cinema, I always do it at times when there isn't anything important that can come up which can disrupt my viewing experience. And again, when going to the cinema you pay to see the film in its entirety with no breaks, if you use your phone in the cinema you end up disturbing other people and you could miss important parts of the film which you can't see again. This goes to the other idea of the person to make this viable in a few screens only. In this case, people who don't want to experience all of this stuff whilst watching the film may be forced to because the times in those screens are more convenient for people than for screens where this isn't the case. This feels like punishing the people who don't want to be disturbed in order to cater for the minority of people who clearly don't care about the film they're watching and so disturb the film for other people. Lastly, he talks about certain types of films that are suited for this, mainly the big blockbusters and then says that he is justified in disrupting the film because he won't miss anything. Unfortunately for him, he uses Pacific Rim and Iron Man 3 as the examples. These films are based so much on the visual storytelling and the world built around the film which you'll miss if you are paying attention to the film, especially Pacific Rim. It feels like this guy is insulting the filmmakers for making films that do not cater to his desires and so he is justified in disrupting it. There is also the fact that you don't know whether or not a film will be easy to follow before you watch it. Sure it is pretty easy to follow Pacific Rim but what about Iron Man 3. What if you are so busy on your phone that you miss the major plot twist. And before anyone says that you can still hear it, when you are focused on something else you try and block out other sounds so that you can just focus on that one thing. I know that when I've been listening to podcasts while reading I didn't really hear what was being said. Whose to say that this won't happen in the cinema. This would be even worse for films like Skyfall, Django Unchained and Lincoln. All of these films have been pretty big hits but you need to pay attention throughout the film so you don't miss the important plot points for later on. This is even more important for comedies like The World's End where the jokes come in so thick and fast that if you look away from the screen for just a minute you've missed a dozen jokes. My viewing experience for these films was better because I paid attention throughout the film so that all the important stuff in the beginning and middle of the film paid off at the end and in these types of films it is incredibly easy to miss all these small details if you are busy looking at your phone. So in summary, this idea of allowing people to use their phones for the internet during the film is incredibly stupid. Not only does it heavily distract people who want to watch the film, which is even a problem in the separate screens scenario, but it also disrupts the personal viewing experience of the film as a whole and is pretty much pointless because these people are better off watching films at home. You can disturb films on your own when there is no-one else to complain but let the cinema be for the people who just want to watch the film. 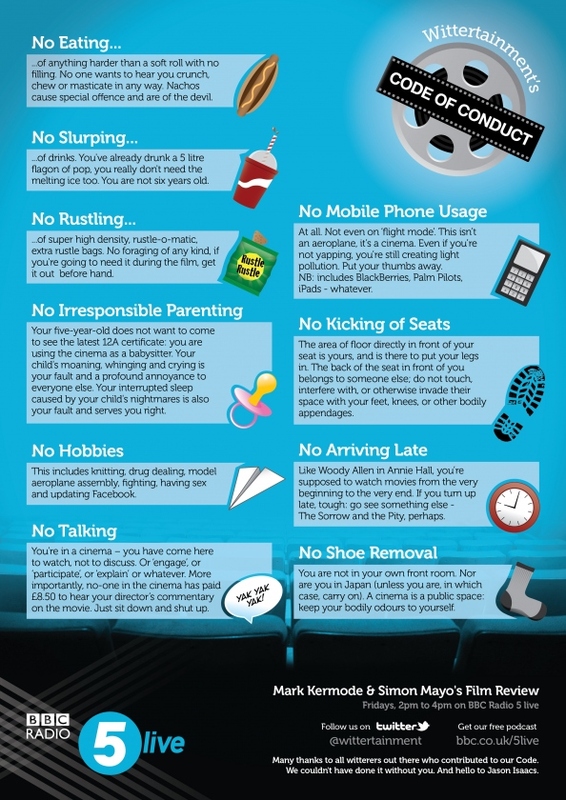 It's people like this that really make me wish that the Kermode Code of Conduct (see below) was enforced at every cinema in the world so that they know that they are not welcome at the cinema. Completely agree, Tony. That idiot seems to not really be that bothered about actually experiencing the film at all, he just wants to be somewhere other than at home or at work, where he can still use his phone but technically be out 'socialising'. How exactly would talking be controlled in these screenings too? Surely if it's OK to not pay attention to the film, then it would be fine to hold a conversation, or take phone calls during it as well? Which just opens up the possibilities to people opening a laptop and playing a different film, if the one they're watching loses their interest (as has happened to me on trains before, with two separate people both trying to watch different films, neither with headphones). However, if we were to create such a relaxed screening, I do believe that the other, stricter screenings would become more civilised for patrons like you and I who just want to watch the film. You could even have a three strikes system for the civilised screenings, whereby multiple code of conduct infractions relegates the viewer to enduring the uncivilised screenings for their next 3 outings. That way, screaming babies, running children, mobile phones etc. would all be gone, leaving the rest of us (approximately 5% of the viewing audience, by my count) in peace. I never understand people who try to watch 2 different films at the same time. If this type of thing continues we'll go even further than Back To The Future 2 territory and instead go to Black Mirror: 15 Million Merits (http://www.youtube.com/watch?v=7vsYnaqpIpE&list=TLdXtSac6aw3s in case you haven't seen it) territory. Well the ushers at my cinema would have to go through an R. Lee Ermey style bootcamp in order to work there. I'm not sure about the same-time screenings. It would be nice, but impractical in terms of having enough screens. In the past I've foregone seeing films when they've only been available in 3D when I'm free, so I'd do the same thing with the uncivilised screenings. I think the main problem would arise when the uncivilised screens became more popular due to the harshness of the staff at the civilised ones, and eventually the civilised screenings would be relegated to 11am on a weekday, when I'm stuck at work, and every other screening be handed to the gaping maws of the great unwashed public.